Laotu is a social enterprise which was founded at the Polsky Center for Entrepreneurship and Innovation at the University of Chicago and is now based in Shenzhen. Laotu promotes responsible consumption and a new sustainable development scheme for China and the world. Based on storytelling, it provides a platform for ecologically produced agricultural products to reach urban customers, and helps to connect rural and urban residents via ecotourism and educational programs. 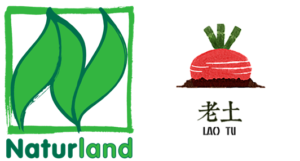 Naturland is a farmers’ association based in Germany that develops and implements ecological farming methods on a regional, national and global scale together with its partner organisations and farmers. Founded in 1982 in Bavaria, it established a strong basis in the region before it extended its membership in whole Germany, Europe and even globally. With a total of 3,448 farms on more than 181,000 hectares, and 434 enterprises in other EU countries, it is one of the major international associations for organic agriculture worldwide.